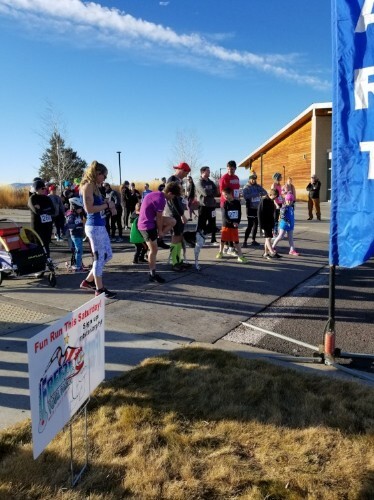 MountainStar and friends were joined by runners from across Central Oregon at the Madras Aquatic Center for the annual "Freeze Your Fanny" fun run. With temperatures in the upper 30's, racers, supporters, and sponsors came together to raise a record $2,830 for MountainStar's child abuse prevention programs in Jefferson County! Athletes ran the challenging course choosing between a 5k run, an 8-mile run, or a run/swim duathlon featuring a 5k run followed by a 500-meter swim. For their efforts, all participants enjoyed a hearty bowl of chili and cornbread inside the beautiful Madras Aquatic Center conference room overlooking the Cascade Mountain Range. MountainStar Madras Board Member Dr. Bud Beamer gave a brief presentation about MountainStar following the race and awards were presented to the 1st place finishers from each race category. Some ran, some walked, and some even rode scooters across the finish line. No matter how they finished, it was all for a good cause! Funds will benefit MountainStar Madras' Therapeutic Early Childhood Program which brings children into classes at MountainStar for individualized care, giving them the one-on-one attention they crave and the boost toward development they desperately need. Check out our full results at http://mtstar.org/fyf/results.html.